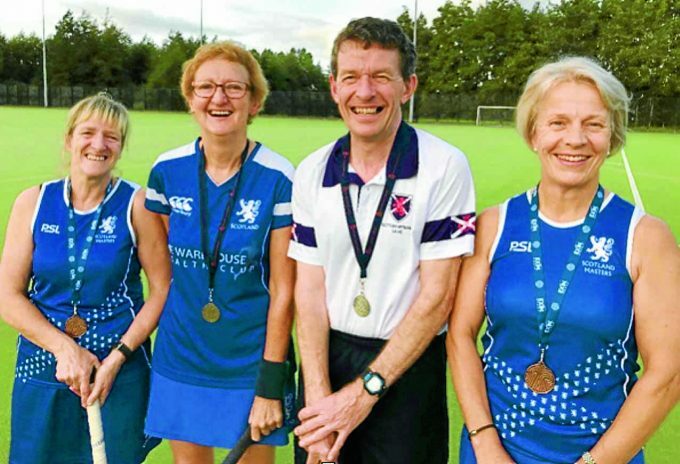 DUMFRIES Hockey was well-represented this summer at both the Grand Masters World Cup in Barcelona, Spain in June and at the Masters World Cup in Terrassa, Spain in July/August. Gladys McClymont and John Bennett represented Scotland in Barcelona, with Gladys winning a bronze medal with the Scotland Women’s O60s and John winning a silver medal with the Scottish Thistles O60s. Then, Angela Beattie and Margaret Miller played for the Scotland Women’s O55s team in Terrassa, and won a bronze medal – only missing out on the gold medal match by the smallest of margins. The Scotland O55s Women’s Team, including Angela Beattie and Margaret Miller have been nominated for the Scottish Hockey Team of the Year 2018. The other nominees are Scotland U18 Girls’, Scotland U18 Boys’ and Scotland Men. A public vote will count to the final Team of the Year Award with the award due to be presented at the Scottish Hockey Awards gala dinner at the Caledonian University Conference Hall, Glasgow this weekend.